Mother’s Day is just around the corner and those of you who are on top of your game have probably already sent a card and arranged to give your mom a thoughtful gift of flowers, candy, or a gift certificate to a spa. For those of you out there who have done none of the above, Animoto, a startup that automatically generates high quality slideshow/music videos from a set of photos, offers you the ability to make a heartfelt video greeting that would warm any mother’s heart. 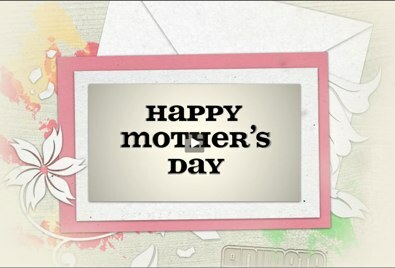 The site features a Mother’s Day card that allows you to submit a handful of photos to automatically create a sentimental video-slideshow set to your mom’s favorite music. It’s an easy, quick and and innovative way to show your Mom how much you love and value her on Mother’s Day. Animoto, which launched in 2007, also helped users make creative slideshow greetings cards on Valentine’s Day and and over the holiday season. Animoto offers a nifty service and does a nice job of spicing up photo albums, with little effort needed on the users’ part. Competitors include RockYou and Slide.